What remains when 40 litres of seawater evaporates? How does a stock cube look like when it is prepared from 10 litres of seawater reduced by cooking? The invisible salt content and the dissolved organic matter manifest themselves as colourful residues in a series of soups, salt paintings and split image seascape photos. Installation entitled Seawatercolours consists of a dining table set with 13 soups and 12 stock cubes. 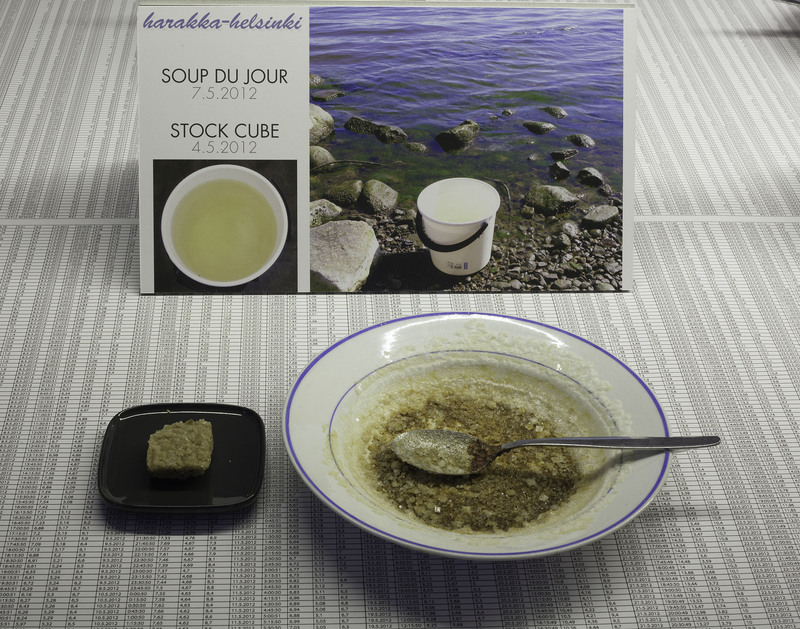 Each Soup du Jour or stock cube is prepared of one bucket of seawater reduced by cooking. The water samples are collected from Harakka Island in front of Helsinki starting May 2012 through April 2013. Together with the Salt paintings and a prototype viewing device Water Colour Scope, the work visualizes the monthly variations in the quality of the seawater and represents the state of the Baltic Sea during the course of one year. Tuula Närhinen (FI) is visual artist based in Helsinki. Images derived from scientific investigation are the core of Närhinen’s art, along with a dry sense of humor. She is an investigative artist, inventive and methodical. Her topics are landscape, natural phenomena and environmental issues.